Federal Tactical 12 Gauge Ammo 2 3/4" 00 Ball Buckshot 9 Pellets ammo for sale online at cheap discount prices with free shipping available on bulk 12 Gauge ammunition only at our online store TargetSportsUSA.com. Target Sports USA carries the entire line of Federal Estate ammunition for sale online with free shipping on bulk ammo including this Federal Tactical 12 Gauge Ammo 2 3/4" 00 Ball Buckshot 9 Pellets. 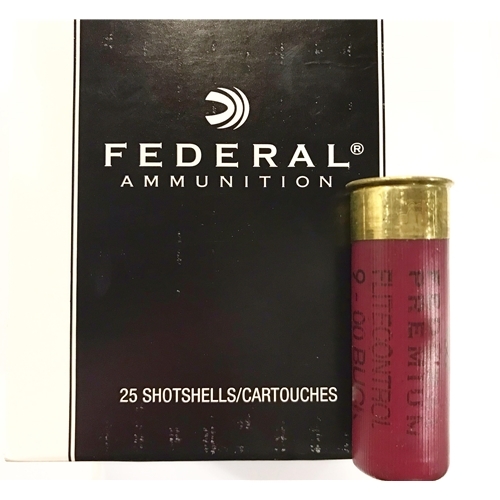 Federal Tactical 12 Gauge Ammo 2 3/4" 00 Ball Buckshot 9 Pellets ammo review offers the following information; Federal Premium has turned shotshell technology 180 degrees with the new FLITECONTROL Wad. This exciting and innovative shotshell system delivers the tightest buckshot patterns available for law enforcementall without expensive barrel alterations or aftermarket choke tubes. Tactical Buckshot also features copper-plated shot and recoil reduction that, when combined with the FLITECONTROL wad, result in the most dependable and predictable pattern performance available. Tactical also features a solid brass head for reliable functionnot brass-plated steel that can swell and cause extraction issues. To top it off, all Federal Tactical Shotshell offerings are loaded with the unique and famous, Basic-Lead Styphnate 202 primer. . This round measures 2 ¾” in length and is capable of hitting impressively tight pattern shots with the 9 pellet 00 Buckshot bullet.